during qualifying for the Monster Energy NASCAR Cup Series Hollywood Casino 400 at Kansas Speedway on October 19, 2018 in Kansas City, Kansas. 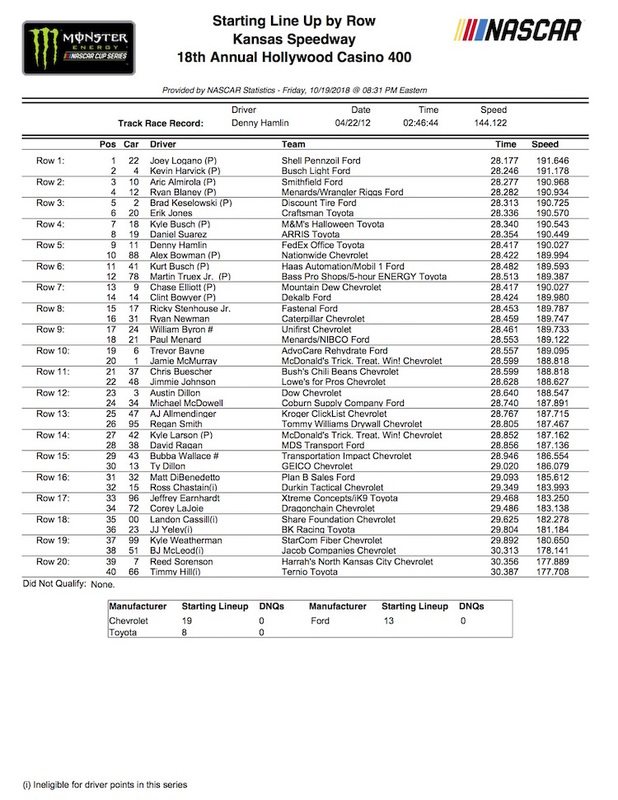 A 28.177-second/191.646 in the third of three laps of Monster Energy NASCAR Cup Series qualifying at Kansas Speedway on Friday garnered Joey Logano the pole for Sunday’s Hollywood Casino 400, the elimination race of the second round of the 2018 playoffs. 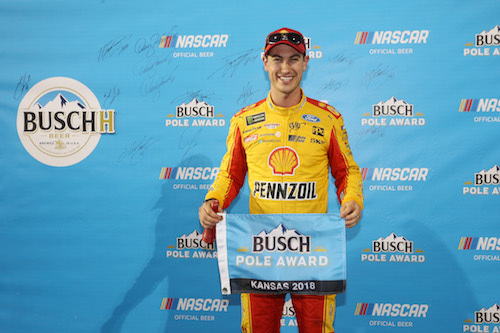 Logano’s latest pole is his second at Kansas Speedway but his first pole of the 2018 Cup Series season. Fords claimed the top-five spots on Sunday’s starting grid. Kevin Harvick was second in the final round to share the front row with Logano. Aric Almirola, Ryan Blaney and Brad Keselowski qualifying third through fifth. Harvick was second in all three rounds of qualifying. In the first two rounds, he trailed Stewart-Haas Racing teammates. Clint Bowyer led the opening round with a 28.228-second/191.299 mph lap but failed to get beyond the second round of qualifying. Instead, he wound up 14th. Almirola led the opening round with a 28.239-second/191.225 mph lap. Meanwhile, playoff driver Kyle Larson’s qualifying efforts sputtered out in the opening round. After going to a backup car because of a practice crash, Larson was the only playoff driver to not advance beyond round one. He wound up 27th, but will drop to the back for Sunday’s green flag as a result of the move to a backup. Chase Elliott was the one other playoff driver to not make it to the final round of qualifying. He missed advancement by one position, qualifying 13th for Sunday’s race.